Uglyworld #715 - Pack-N-Seeks (223-365), originally uploaded by www.bazpics.com. 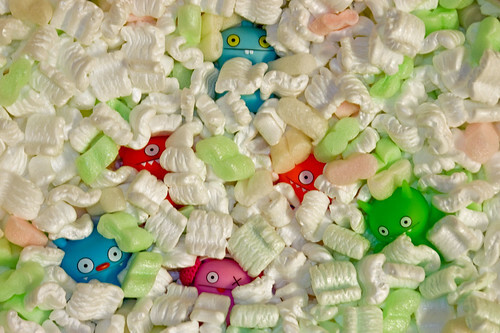 It doesn't seem to matter if a new box arrives for my attention when I'm at home or staying in a hotel, there appears to be some strange habit written deep in the code of all Uglydolls that makes them completely obsessed with packing quavers material. As soon as I have the box opened up I'm lucky if I can get the contents removed before at least one of them does a "dive bomb" ugly style into the packing material and then nestling into it as quickly as possible before shouting "Pack-N-Seeks" which as you can imagine results in every other ugly doing a similar dive into the box. Thankfully this time I managed to retrieve all of the fragile parts which work shipped out to me before they went mental!